I’ve always thought that weather was one of the dullest topics of conversation, one that you bring up only when you’re trying to fill an awkward silence. But now that this heatwave is stretching into its third week, I find myself in many weather-related conversations, especially when talking with our vendors. The heat is uncomfortable for many of us but it’s especially taxing on our farmers, who spend their days in the heat tending to their crops. Temperatures above 90 degrees are of no use to most crops and harmful to others, so a farmer must be careful to irrigate sufficiently and pick vulnerable fruits and veggies, like berries and greens, at cooler times of the day, before they are susceptible to sun scorch. 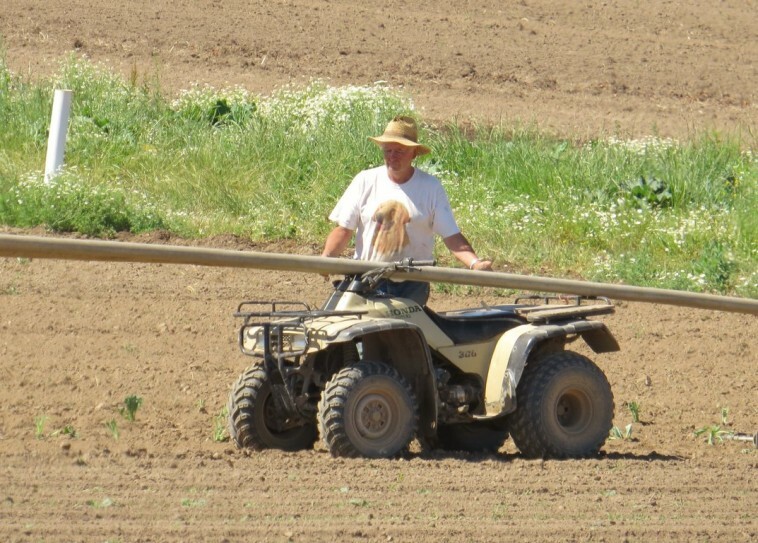 Needless to say, the heat is also dangerous for farmers and their helpers. Sun stroke, sun burn and dehydration are all things a farmer must be cautious of, so they must do their best to harvest crops before the heat of the day and find work in the shade for the worst times. Our farmers’ work is not done once harvest is complete, of course, because then it’s time to prepare fo r market. Several of our markets, including PSU and Shemanski, are nestled among the trees and are mostly safe from the direct sun, but many of them are not, so selling at a market can be a full day’s work, also in the sun. When we visit a grocery store and choose fruits and veggies from a display, it’s easy to disassociate that food with a person, but when you buy a pint of berries or a bunch of carrots from farmers like Marven (Winter’s Farms) or Vicki (Sun Gold Farm), and hear about the effects of the weather on the crops and their business, it’s a good reminder of the hard work our farmers put in to bring the season’s bounty to market for us all to enjoy. So next time you’re at the market, excited about the early arrival of late-summer favorites like corn and peaches, remember to take a moment and appreciate the hard work it took to get it there. And then, of course, be sure to take some home and appreciate how good it tastes. Happy shopping!